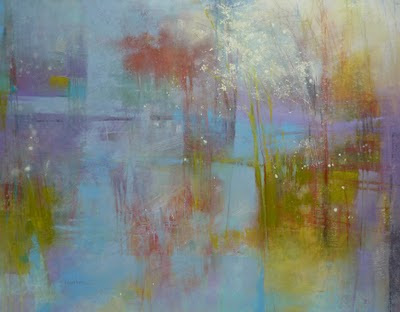 Sat another shift at the Women Painters of Washington Gallery for the current exhibit, "Wonder!" 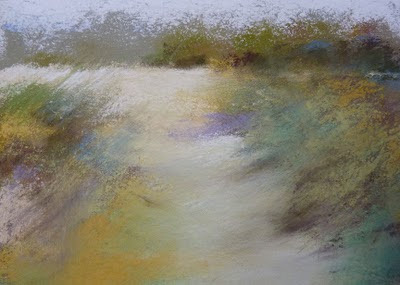 Took along my pastels for a few minutes of quick, small landscapes. I am honored to have my painting, "Tuesday's Child" included in the International Association of Pastel Societies Sixteenth Juried Exhibition at the Butler Institute of American Art, Youngstown, Ohio. 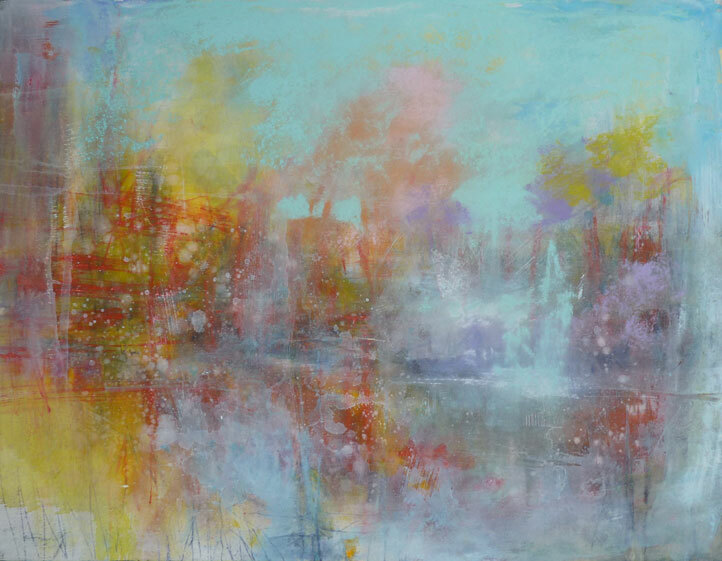 To see images of the 36 pieces in the show, CLICK HERE. Every once in a while I have to stop painting and frame completed pastels. I love to see the work all lined up, ready to go to shows and galleries. It is a good time to clean up my pastels, vacuum the studio and start again - maybe in a different medium for a while. This is the completed painting based on the foundation I posted yesterday. 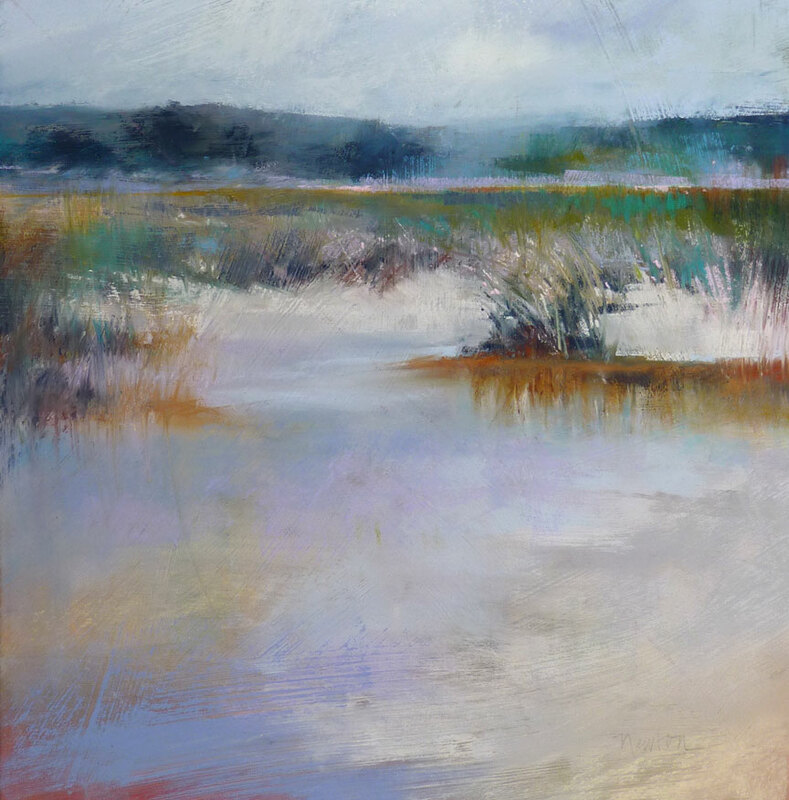 As I push the pastel around with my fingers and other tools, it makes me want to paint with something more fluid...I may switch to oil paint for a couple months. Loved the mustard fields of California. Click image to enlarge. I have reworked so many old paintings lately that to start a new painting today with a bare piece of paper is a novelty. This is a piece of Wallis with ochre gesso that has been in my flat file for a couple years. Today I applied a thin oil-paint foundation based on the composition in my reference photo. 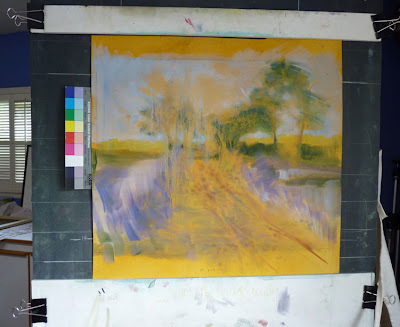 Here it is, on my easel drying. I'll post the finished painting soon. By the way, the Kodak color bar and grayscale go into every photo I take of my work to make sure the color is correct. But, after including it here, I decided the color looked OK and is not critical anyway since this isn't a finished piece. Another version of the sand and water of the Carmel River in mid April. This time it is larger, 12.25 x 12 inches. Click on the image to enlarge. 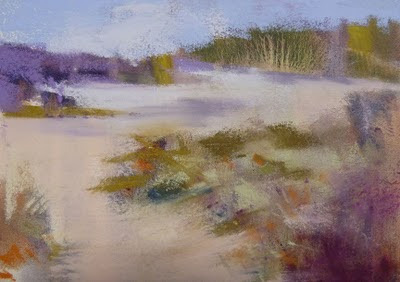 Another little painting of our unusually cool and windy day on the sandy banks of the Carmel River this spring. The wind sweeps the sand up into berms along the banks of the Carmel river. 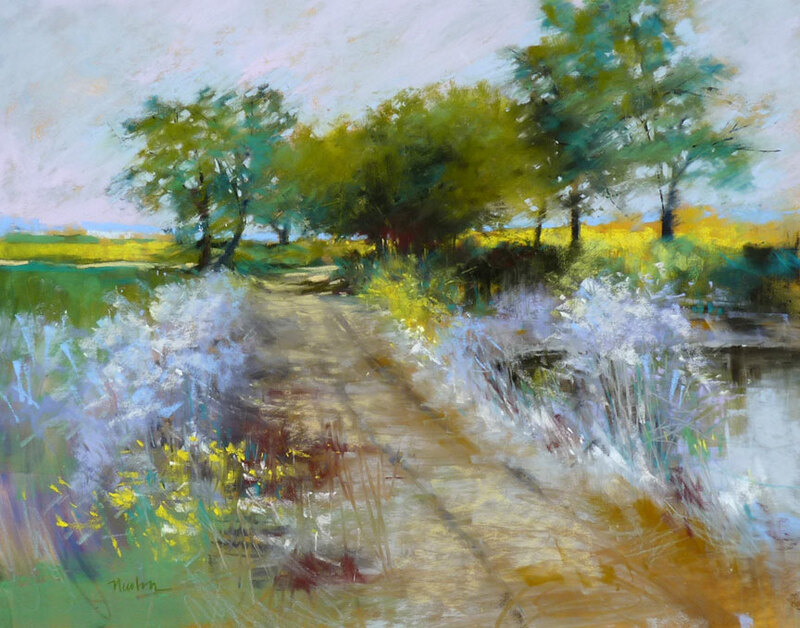 These paintings reflect the unseasonably cool and stormy weather of mid April this year. Another 5 x 7 inch painting inspired by the sand dunes near the Carmel River. A quick little study to capture the feeling of the place, not the details. I spent the day sitting the Women Painters of Washington Gallery in Seattle. Six hours of art talk with friend and WPW member Kristi Galindo Dyson. 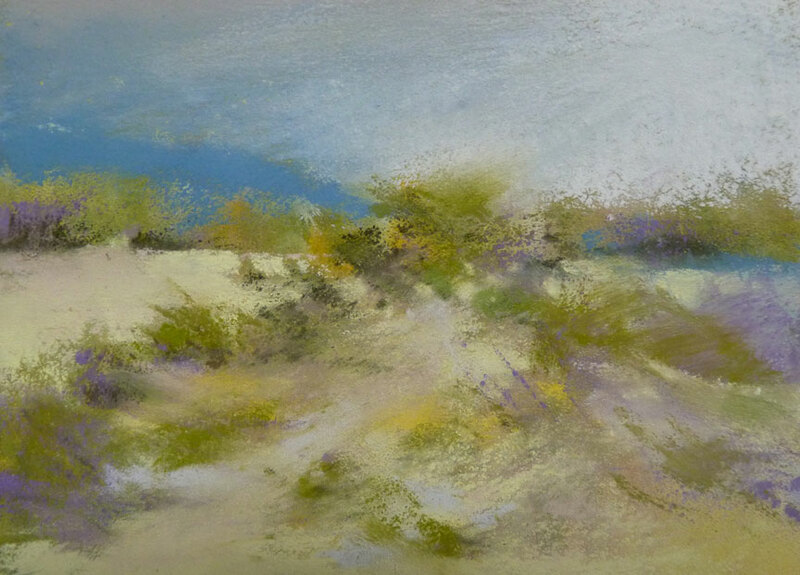 I also got in a little pastel time working with ideas from the reference photos of sand dunes taken on a recent trip to Carmel, CA. 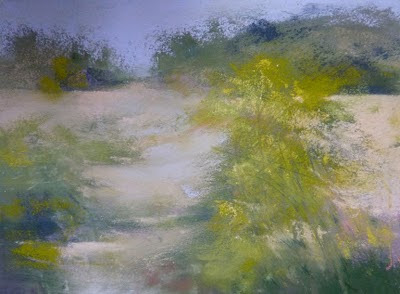 This painting is little - just 5 x 7 inches. Working fast in this small format gives the fresh look that I wish came as easily in my larger work. I am pleased to be included on the blog, Artists in Pastel. To see my posting, CLICK HERE. Scroll down on the page to see the text under the image. My thanks to Oldenbroke, blog author. Once again, I went too far and lost the spontaneity of this piece. After painting on it for a day, I turned it upside down and began again. I am finding this process of going too far and starting again is now my usual modus operandi. Then I come to a time when I ask myself if I am stuck or finished. At one point this piece felt like it was flying apart. I added connectors to hold it together. Then I felt the value range wasn't broad enough - it needed more darks and more lights. Now I'm content and life goes on. I have posted it with my recent work. The first step of repainting on this piece of Wallis was the application of a thin oil paint wash of white, yellow and red. Within an hour that was dry and I was able to begin applying blue and lavender pastel. At this point the painting was fresh and spontaneous, suggesting ideas for composition and content to me. 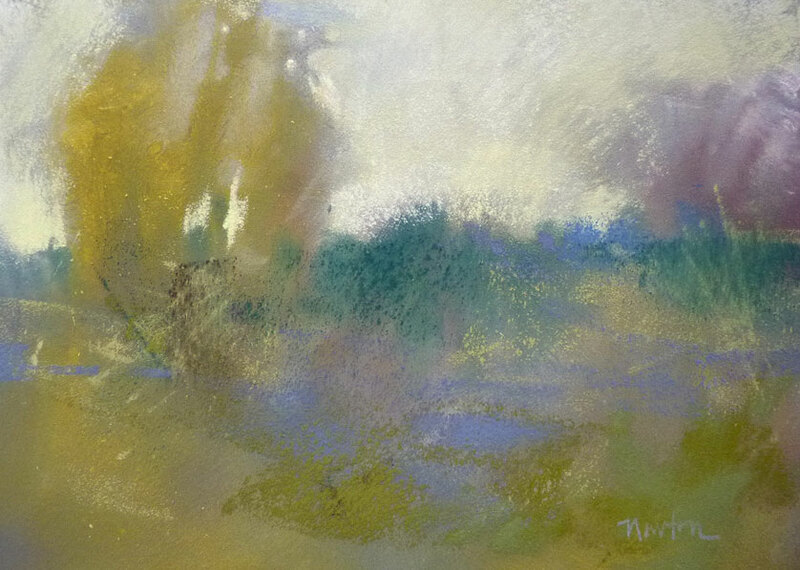 A warm Saturday morning and a good day to wash off another old pastel painting so I can begin again on the same Wallis paper. This one is 19 x 25 inches. 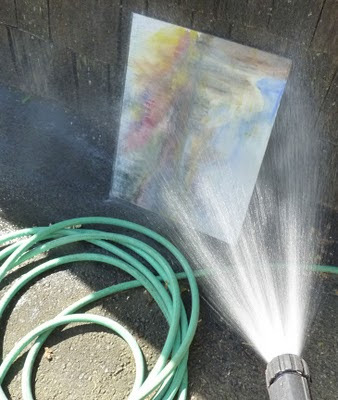 In this photo, I'm blasting it with water from the garden hose and because it is a sunny day, I'll leave it here to drip dry. In 2006 I began a paper, spiral-bound art journal. 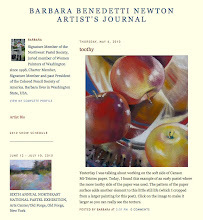 In 2008 when it was full, I discovered blogging and created an online art journal that has worked well until recently. I have feed trouble... some subscribers still get postings by email, others haven't received one since April 14th. I've spent a lot of time trying to resolve the problem but have decided I'd rather be painting! For that reason, I'm starting a new art journal with a subscription that works. I hope you've enjoyed my previous journal and will continue with me here.